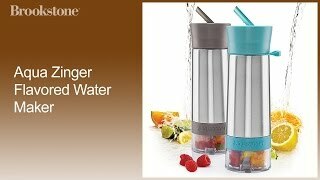 Aqua Zinger Flavored Water Maker at Brookstone—Buy Now! Infuse your water with the juice and essence of fresh fruits. Quench your thirst with refreshing, natural flavors. Add flavor to your water with natural fruit juices. We all know that we need to drink more water—and now it’s easier than ever. The Aqua Zinger infuses the flavor and essence of fruit juices into plain old H20. And best of all, it’s natural. Satisfy your palette and increase your water consumption by infusing cucumber, lemon, lime, blackberries, kiwi, strawberries, peach, mint and more. Mix and match—get creative! Pressed for time? All you have to do is twist, shake and enjoy. Just add your favorite fruit to the extra-deep, bottom-mounted grinder, screw the bottom lid back on, fill with water, shake and let soak! By screwing the bottom cup back on, you simultaneously grind the ingredients, releasing the flavorful juices. The fine-combed, mesh screen makes sure the pulp stays put and only the pure extracted flavors are released. Take Aqua Zinger with you wherever you go. The unique, leak-proof cap lets you Zing anywhere—in the car, at the gym or on the town. Also equipped with a finger hold carrying handle for easy transport to and from activities. Aqua Zinger offers a fun, natural way to enjoy your water. Order yours from Brookstone today!